This is a zigzag tensegrity based on a small stellated dodecahedron. There are string pentagons on the outside of the model where the vertices have opened. It is made of thirty units, consisting of a barbecue stick pair with a loop of elastic. The stick pairs are all "floating", and weave through the model without contacting any other stick pairs. It is quite tricky to assemble, but can be done entirely by hand. 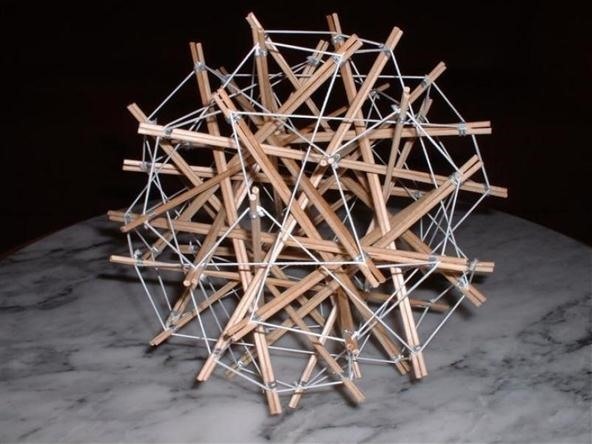 I have put up a Tensegrity Model Album with views of this and other models made from barbecue sticks. This is amazing. Really beautiful. We would love for you to post a How-To!!! nice work, is it springy ? It was springy when I made it, but the elastic I used went slack with time.